A brief summary of the game from Wikipedia should be good enough >.<"
So, Legend of Cao Cao has been a huge hit for the Chinese internet communities because of their softwares to mod the game. Being able to replace and change everything from scratch, the game can be modded to play at a entirely new experience. 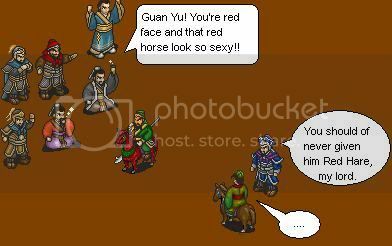 Since everything can be modding, the Chinese communities created their own sprites and made them animatedly run on their LoCC (Legend of Cao Cao) mod. Popular sprites are the 'Romance of the Three Kingdoms XI' portraits, made to become deformed sprites to fit into the gameplay of LoCC. Compare them if you wish, but keep in mind that some of the costume's colours are changed to keep the players in the mod to not be confused. -People who served Cao Cao and Wei. -Under service of Liu Bei. -Under service of the Sun family. -Under service of Lu Bu. Lu Bu and Yuan Shao's army will be next. Last edited by Masatog on Wed Aug 25, 2010 12:22 pm, edited 2 times in total. Current Avatar: RTKXI's Chen Gong in LoCC sprite. I'll just use a new post to post up random images I make up with the sprites. The first post sprites were just used for talking scenes. These sprites in this post are used in battle. They are all according to Romance of the Three Kingdoms XI's model again. Some sprites are easy to recognise who they are if you are familiar with the game, some are not. There are more, but that will fill up this post by a lot. Oh, and I didn't make these sprites so I don't claim ownership of the design. Credit goes to the sprite designers of "Saint, Legend of Heroes" mod game. Drop me a PM if you want a complete character's sprite sheet. You did an awesome job with those. I especially like the sprite for Dian Wei. Location: I will not join Wei and Wu!!! @Yuen Ho: The Chinese community who make sprites especially to LoCC games. They have made heaps though which is impressive. A new batch of sprites have been released. I'll get them up soon. Oh ok -- either way, the sprites look great. Well, here is the update. Making Cao Cao's officers more better than the previous sprites they made. Oh! Thank you for this! I've been looking for sprites like this for a while.